I thought that I'd found the best deal on this item at £129.99 from my local camping store (they're up to £179.00 elsewhere). Have just seen them at only £99.99 from Argos so I reserved one quick. I'm in Chester and there aren't any there I'm afraid (I had to reserve from nearby Wrexham). Not available for home delivery, you must try to find one in a local store and reserve for collection. Possible Quidco, but at this price, who cares?! We used one of these for my Daughter's recent birthday party and it was great. We actually had a really sunny day so it offered sun protection, but it is a great rain refuge too. Might be worth considering a smaller 3mx3m quick setup gazebo. 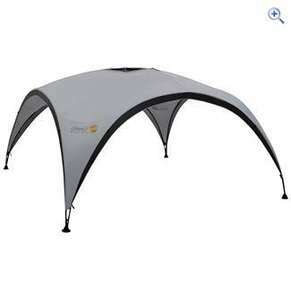 Just bought one which has 4 sides (2 with windows) and a wind bar to help keep it sturdy. Idea World TV were selling these without the windbar for £169.99 and I paid £81 inc next day delivery. It's fully waterproof too. Web address below for those interested. Why don't you post a separate deal? Collected 1 and have option on the other. PM me if anybody's interested and I'll give you the reservation number. Too late now folks, 'Jim' has it. Reserved 2 by mistake at WrexhamCollected 1 and have option on the … Reserved 2 by mistake at WrexhamCollected 1 and have option on the other.PM me if anybody's interested and I'll give you the reservation number. Used one of these this weekend - great but tend to lift from the guy ropes in the wind and although it says nothing about holding water in the description, they certainly dont hold water for long - in fact, in the rain the poles act like a massive shower head - believe me, these look fabulous but even at £99 are not worth the money - as a previous poster suggested, get a gazebo!